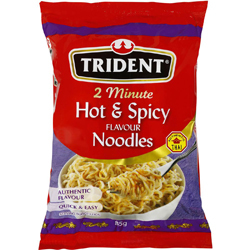 2 Minute noodles with an authentic Thai flavour that is quick and easy to make, great as a snack or as a base for a meal. Salt, Mineral Salts (E501, E500). Chilli Paste: Palm Oil, Spices (Lemongrass, Kaffir Lime Leaves, Shallot, Galangal, Garlic), Chilli, Shrimp Powder, Fish Sauce (Fish, Salt, Sugar). The Best Noodles in the World Ever!! These are amazing my girlfriends kiwi and she introduced me to them, great for a quick snack, love them, so try them! !